In this book, Robert Colls sets out to chart George Orwell’s changing attitudes towards “Englishness”, and the various positions he holds, and tries to hold, in relation to it. He achieves this through a mixture of biography, political history, and literary criticism that weave together to create a narrative full of depth and interest. What results is a picture of George Orwell as a dual personality; he is both the man he is, and the man he wants to be. He is Eric Blair. He is George Orwell. He is a man from the comfortable upper-middle classes, trying to throw off the attitudes associated with his background. A true idealist, Colls’ Orwell is at times a stubborn contrarian, a man who looks but doesn’t see. He is well-intentioned and easily affected by the circumstances of others; a ‘belly to earth’ kind of guy, interested in telling things as they are though not always succeeding. In choosing to follow a single strand of Orwell’s politics rather than a more general course, Colls is able to draw out the complexities of Orwell’s often contradictory positions and interrogate his reasoning. Colls does not flatter his subject. He is able to take Orwell to task for some of his less sound ideas, and for the times he makes sweeping generalisations or overlooks important facts in order to maintain his vision of how things are. Particularly well argued in this regard is Colls’ contention that Orwell refused to accept the engaged politicisation of the working classes in spite of the growing existence of unionisation and workers parties. The idea of working-class simplicity and helplessness was so central to his arguments that their growing politicisation presented a real blind-spot for him. This criticism is made possible by placing Orwell in his historical and political context. Rather than focussing on Orwell’s own political ideas and how he saw the events of the period, Colls sees Orwell’s position within its contemporary climate, where he is able to judge it with a degree of objectivity. The biographical elements of this book are all put into service of Colls’ central thesis, and as such form more of a backdrop to proceedings. We see Orwell’s Etonian childhood, his upper-middle-class family, his colonial heritage, his time in Burma, in Spain, and back in England, all through the central preoccupation of how they relate to his sense of Englishness. As a result of this focus, his first wife receives scant attention, as do his friendships and other family bonds, including those with his adopted son. Thus, the Orwell of this book can cut quite a solitary figure. Colls’ discussion of Orwell’s literary and journalistic output is driven by the same impetus; to further explicate his constantly evolving relationship to England and ideas of “Englishness”. In following this line, Colls is able to offer fresh insight into Orwell’s works, particularly earlier works such as The Road to Wigan Pier, and Coming up for Air. 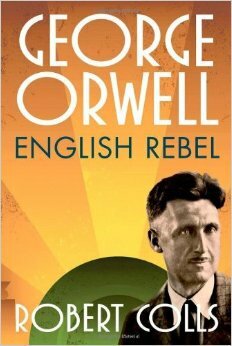 For Colls, Orwell is a better essayist than a novelist, and a writer over a journalist. He has particular praise for Homage to Catalonia, in which Orwell ‘is a book-length essayist trying to capture the intimacy of the first-person novelist.’ True to chronology, Orwell’s novels are not covered until the final chapters of the book, where Nineteen Eighty-Four, in particular, is carefully considered both for its politics, and for its lasting resonances in twentieth-century culture and beyond. The book ends with a ‘bibliographical essay’ that provides an overview of some of the works that have been written about Orwell since his death. Colls also offers some concluding comments on the ideas that have been raised throughout the book, and adds some interesting speculations about how Orwell might have viewed more contemporary national and world events. In not attempting to be comprehensive, George Orwell: English Rebel has succeeded in doing what it set out to do with both insight and finesse. Colls’ prose style is engaging, with the occasional nudge into the humorous. This makes for a lively reading experience in what is, at heart, an academically-minded work.